While watching the approaching tornadoes on Tuesday Maeve said, " Ya know when we lived in Rhode Island watching Storm Chasers was amusing." So true but no longer. Tornadoes swept through Central Oklahoma today. I think the weatherman said there were at least four that touched down. We actually had a reason to weather obsessed today. 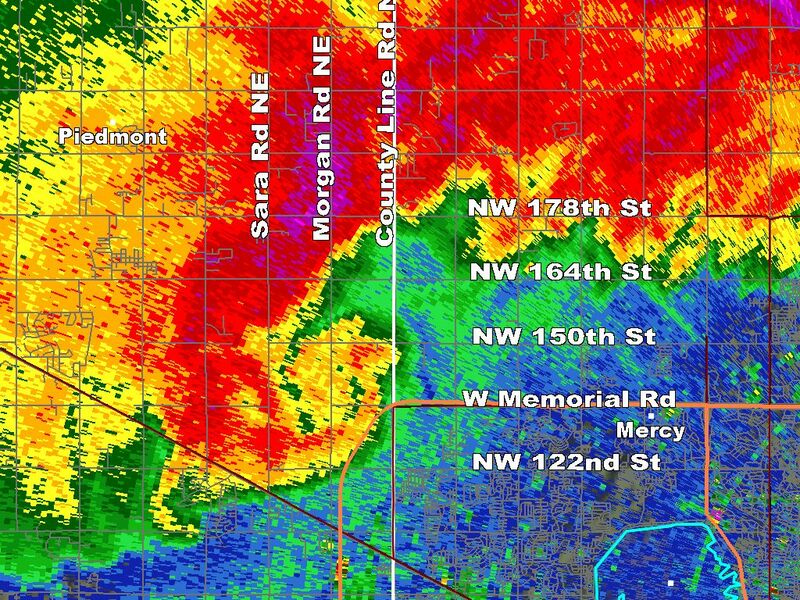 There was a "maxi" "long track" "F4" storm that swept from out West up into the Metro and it came within ten miles of us. Daniel drove home trying to beat it and he did - thank goodness (that's an understatement). He came home and about ten minutes later that siren went off and we went to our safe place - the master closet. While the girls and I tried not to cry, Daniel told us on his way home he saw fireman standing on the street corner conducting a boot drive. I think he was trying to calm us down. After about twenty minutes in the closet we realized we were safe. 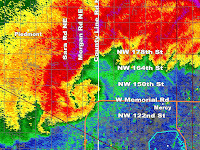 The tornado had passed to our west and wad heading to towns North. This particular one made it all the way past Stillwater. We spent the rest of the evening watching the rest of the storms move East. So what did I learn from today? Gary England is the best weatherman in OKC. The guy on KFOR was screaming and scarred us to death. Gary England was calm and level headed and that's what you need in a storm. I am glad my husband came home, even though it was dangerous. I needed him in the closet. I learned we can make it through a tornado warning. I learned that even a crisis moment can be sacramental. The girls and I prayed for Daniel, we prayed for our safety. They knew people were praying for us. The prayer helped - a lot. We were really in a safe place. Deep breathing does help calm your nerves. Chocolate strawberry cupcakes are a good way to celebrate being alive. I am definitely calling about a storm shelter. Grateful has a whole new meaning. We came back to OKC just in time for the next round of severe weather. Wednesday and Thursday severe thunderstorms rolled across central Oklahoma. This was our first real threat of hail, high winds and tornadoes. I was glued to my computer all afternoon watching the progress as it moved toward us. I was so glued that I completely forgot to prepare for dinner. Maeve had to remind me that maybe dinner would be good to have. I guess it could have been worse. She could have made dinner for herself , ate and left me mesmerized by the swirling patterns of red, yellow and green. I signed up for texts alerts from the weather stations. Daniel emailed me the tornado watch alert his company put out. I watched the tv forecast. I logged into NOAA for the latest storm track. I even watched the streaming video from the storm chasers cars. By the time the storm hit the weatherman was ticking off the timetable. Minco 7:15 Yukon 7:20, metro by 7:30pm. They had it down to the minute where the storm would hit. There were a few tornadoes sighted but nothing huge. The thunder started at our house at about 8:15pm and lasted until about 1am. Hilde asked to sleep in my bed. I said no. We have too many storms to let that precedent take hold. I was trying to strike the right balance between preparation. (Knowing when to run for the closet) and calm. I didn't really want to scare my children. Again, we have too many storms for that to be a good idea. I don't think I did a very good job at striking that balance. We all ended up too worried about a storm that turned out less threatening than predicted. So, we weathered the storm but it wasn't my best moment in parenting. I ignored my children all day until the begged for food. I scared them with too much information about the storm and then I wouldn't let sleep in my bed to be comforted. Maybe next storm I will do better. I'll have plenty of practice living in tornado alley. P.S. I did get a quote for a storm shelter, mostly for peace of mind. I watched Oprah today. I know there are better things to do but I have an insane urge to stay culturally relevant and the Oprah show is ending. I must watch every show until the end. I also watch the Behind the Scenes show on OWN. I know, I need to get rid of my TV. I will. ; maybe after Oprah is finished. On to the point. Today was Oprah's greatest show moments. One of these moments was the above quote from Toni Morrison. Toni was relaying a story about showing your children how much you love them using your facial expression. She went on to say moms think we are showing affection by checking hair, clothes, shoes, teeth, etc. Children might see this as criticism, not love. Her "aha moment" was when she realized her children needed to see the joy she felt when she looked at them. Good reminder. When was the last time you looked at your children and your face radiated joy just because they walked in the room? When you are on a whirlwind tour, it leaves you with many thoughts to blog about but little time to blog. We are currently touring Virgina. The first stop was McLean, just outside of DC. We helped cater my father-in-law's wedding. It was a wonderful week of fun work, family, good times, lots of wine and cheesecake. Next we headed out to Chincoteague Island on the Eastern Shore. My sister lived here years ago. We enjoyed, ponies, the beach, a healthy dose of nostalgia, and time with my mom and dad. We also discovered a Dale Chihuly sculpture in seafood restaurant on the island. It was on Maeve's birthday - Wonderful. Now we are in Richmond celebrating birthdays, Mother's day and sending my brother off. My brother is being deployed to Iraq (yes, there is still a war on in Iraq) in early June. This will be the last time I will see him for a while. All of these things deserve many blog pages all by themselves. I will try to do them justice when I land again in Oklahoma. For now, I am pondering how family is such an amazing thing. It can be good and bad. There is joy in seeing your children frolic on beach where you frolicked when you were a teenager. There is frustration trying to coordinate everyone and there is fun when you all finally get together. Time with grandparents is priceless. I keep wishing I could video all the little interactions so Maeve and Hilde can remember them all. There is a heavy weight when your brother goes to war.